The American Health Council is proud to elect Dr. Ramzan Zakir, current Clinical Assistant Professor of Medicine at Heart and Vascular Institute of Central New Jersey, to their Physician Board. With 8 years in his present role and 21 years within the healthcare industry, Dr. Zakir brings to the AHC renowned expertise in Interventional Cardiology with a focus on transradial coronary angiography and stent placement, complex atherectomy, endovascular interventions for patients with peripheral arterial disease and endovenous ablations for patients with venous insufficiency. Dr. Zakir became involved within his current profession as he has always enjoyed the fields and studies of the Sciences, including Biology and Chemistry. 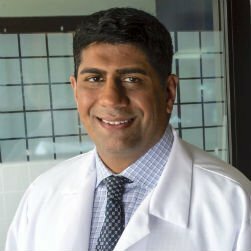 Graduating with his MD from Ross University School of Medicine in 2001, Dr. Zakir went on to complete Fellowships from New Jersey Medical School and Newark Beth Israel Medical Center, as well as a Residency in Internal Medicine from Rutgers University. Dr. Zakir also possesses expertise in Chronic Total Occlusions, which consist of blockages within the coronary artery caused by the buildup of atherosclerotic plaque. These conditions cause obstruction of blood flow, leading to angina and reduced quality of life. At Heart and Vascular Institute, Dr. Zakir engages in day to day responsibilities, including performing an array of complex coronary and vascular procedures, clinical trials, research, and education in addition to office consultations. Dr. Zakir’s professional accomplishments include being an invited faculty member at numerous national conferences. In April 2015, he lectured at the American College of Cardiology meeting in San Diego on drug eluting technology in patients with peripheral artery disease. Honors and awards received by Dr. Zakir include being among the Top Doctors for Castle Connolly, Continental Who’s Who, as well as a general “Top Doc” for the state of New Jersey. He is a Fellow of The American College of Cardiology and the Society for Cardiovascular Angiography and Interventions. He is also a member of the Horizons Peripheral Group, whose goal is to reduce amuptations in patients with peripheral arterial disease. Within the next 5 years, Dr. Zakir plans on continuing to grow within his career. He dedicates charitable efforts to National Police Foundation and the Association of Physicians of Pakistani Descent of North America. He has organized the New Jersey Cardiovascular Foundation, which hosts several educational events a year. In his spare time, Dr. Zakir enjoys playing basketball and tennis, and cites raising his two sons and daughter as personal achievements. Heart and Vascular Institute of Central New Jersey is committed to providing excellence in Cardiovascular Care in their comprehensive state-of-the-art facility and affiliated hospitals. They believe in developing a strong relationship with their patients based on compassion, mutual respect and understanding. The office is equipped with innovative technology to provide exceptional diagnostic services to help initiate a focused, personalized treatment plan to improve their patients’ health conditions.